All runners go through a period of time during which they rarely or never run. Sometimes this down period derives from a lack of motivation, a post-marathon hiatus, or an injury of some sort, like the back pain I have had after my first marathon. Whatever the reason, however, the dedicated runner is sure to grow antsy and eventually make her way back onto the roads. When your motivation returns, your recovery from the marathon is complete, and your back or knee brace has finally come off, you’re going to want to jump back into your normal training routine. Start low and grow slow. The average runner will come back too quickly from any sort of downtime. This can translate into an insufficient fitness build and a greater propensity for injury. To insure that you build in an appropriately conservative fashion, start by running half of your previous weekly miles and then add to that number by no more than 10-15 percent each week. Avoid fresh leg syndrome. When a runner has been sidelined long enough to regain freshness in his legs, but not quite so long as to lose a discernible amount of fitness, he will often feel incredibly fast and fit when he resumes his training. Many runners respond to this feeling by running at a much faster pace than they normally would. Such a reaction can quickly lead to fatigue and burnout. No matter how tempting it may be, try to restrain your pace in the first couple weeks of build-up. Be consistent. 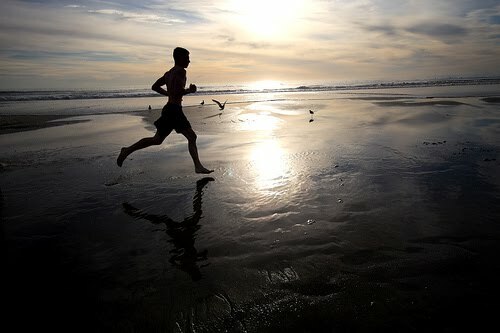 At the other end of the spectrum, some runners return from their break having lost some of their previous fitness. This can be incredibly discouraging to the runner who could once do an hour easily but now wheezes on a thirty minute run. If you find yourself in this situation, make sure that you force yourself to battle through and stay consistent. Unless your hiatus has extended for a year or more, you likely have a strong enough “base” to insure that your previous fitness level can be regained after a month of training at most. These are a few tips to keep in mind when building back up after some time off from running. Approaching this build-up correctly is important for your health, your motivation, and for your training in the months and years to come.